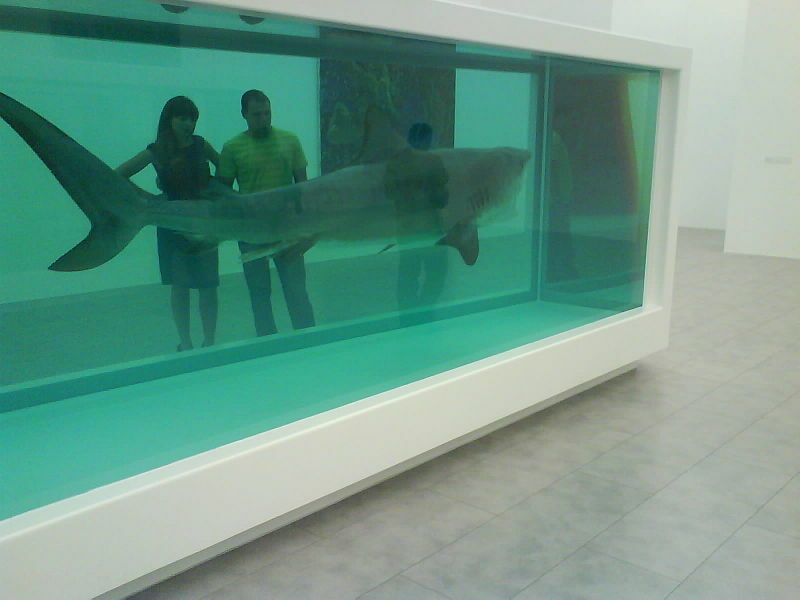 Like many of Damien Hirst’s works, it addresses what is often regarded as the last taboo of our age: our own mortality. We still live with many of the features of modernism, particularly its belief that we can take power and control over every aspect of life and be master over every situation. When things go wrong, our first instinct is to put the blame on a failure of management; and when we meet genuinely uncontrollable forces of nature, such as earthquakes and tsunamis, we are filled with uncomprehending dread. In the beguiling fantasy of modernism there is no comfortable place for death. Few experiences in our society are more uncomfortable than a funeral. And even in moments when we do admit that we will die, can we grasp what that will mean? For even as we imagine the world after our death, with grieving friends sobbing uncontrollably at the grave-side or fractious children squabbling over our possessions, we still imagine ourselves being present, as ghostly observers. It is impossible, says the title, for those of us who are alive to imagine ourselves being dead. There is much to criticise about Hirst’s work, as one might about a lot of conceptual art, such as the overt use of shock tactics to engage the viewer, the lack of craftsmanship and indeed the minimal involvement of the artist in making the work. Hirst, after all, did not catch the fish; the vitrine is an industrial product; the formaldehyde probably required professional handling. The Bible encourages us to think seriously about our mortality: ‘Show me, O Lord, my life's end and the number of my days; let me know how fleeting is my life’ (Psalm 39:5). But this is not an invitation to morbidity, but an encouragement to realism. ‘It is better,’ says the writer of Ecclesiastes, ‘to go to a house of mourning than to go to a house of feasting, for death is the destiny of everyone; the living should take this to heart’ (Ecclesiastes 7:2). We are all destined to die, says the writer to the Hebrews, and then to face the judgement (Hebrews 9:27) and we should therefore consider our future carefully. The purpose of learning to ‘number our days’ is not to become morose or depressed, but to grow in wisdom (Psalm 90:12). Like so much contemporary art it is all questions and no answers, and the studied neutrality of the presentation is disconcerting. Nevertheless, as a Christian one would wish that more people would ask these questions. For in Christ lie answers to all of them: why there is eternity set within the heart of man, why there is death and how our fear of death may be overcome. Death, the last enemy, has been defeated by Christ, who rose victorious from the dead and invites us all to join him in eternity. Damien Hirst, b. Bristol 1965; studied at Goldsmiths' College 1986-9. In 1988, while still at college, he curated the exhibition Freeze which has come to be seen as a landmark event in the development of Britart. During the 1990s he established himself as a leading figure in contemporary British art, gaining notoriety by the use of dead animals, such as butterflies, cows or sheep. He won the Turner Prize in 1995. He benefited early on from the substantial patronage of Charles Saatchi, and Hirst has gone on to become one of the most financially successful artists in the world. 1) Quoted in Sarah Kent: Shark infested waters: the Saatchi Collection of British Art in the 90s (London: Zwemmer, 1994), p. 35.